Want Part 1 first? Here it is. When Corey and I started work on her resume she claimed that her work history had no rhyme nor reason to it. She’d done a little of this, a little of that, and some other stuff too. And if you didn’t know any better, you’d believe her. She worked for a children’s birthday party planning service, a law firm, a realtor group and in various roles for high end hotels and resorts. Her academic background was in science. She didn’t make any sense to herself. Corey was frustrated about her career path for two reasons. The first of which was that she had an injury that meant that she couldn’t stand or be active on her feet for long periods of time. She once had what she considered to be “the best job ever,” and became discouraged and disappointed when her health issues “took over [her] life.” She believed that she unequivocally knew what she wanted to with her life and blamed her health for getting in the way. Corey’s internal beliefs told her that she was being punished for “disobeying” her parents’ wishes with her health issues. She thought that if she didn’t find something more suitable soon that she was just going to give up and become a teacher after all. To help Corey assess whether or not this resume process was worth her while (because you can’t force people to care about themselves enough to re-learn something that they think they understand completely), I explained that this particular resume creation process is about seeing what exists without becoming pre-attached to an image or outcome at the onset. This process is about studying yourself by paying attention to you in your previous roles rather than paying attention to the roles in the absence of the person in them. Analyze your bliss – that’s what a resume is really for. Corey agreed that the Resume Project process would be worth her time and effort because she didn’t like any of the options for work that lay ahead of her under the current paradigm. And she really, really wanted to work. I felt her energy shift to willingness from willfulness. And she agreed that she probably wouldn’t get hired as a teacher with her attitude. By the time Corey and I had reviewed several of her previous jobs, I asked her if she was noticing how her stories from those roles were informing the resume bullets we were creating together. She easily identified that “hospitality” was a strong theme that came up no matter where she was working or what she was doing. With this realization came relief and I heard her voice begin to convey affection for who she was learning she was. As we pressed on in “surprisingly good spirits considering [she was] working on a resume,” it unfolded that Corey had the knowledge to write a book on how to bring a sense of hospitality to the relationship between a business and the clients it served. Corey’s gift lay in her way of seeing the interconnectedness of things and how relationships could be made meaningfully symbiotic – this core theme showed up in how she talked about her science degree and her experience at the law firm, the realty group, the children’s birthday party planning company and, of course, her work in hotels and resorts. Corey was relieved that she wasn’t meant to become a teacher in the “job title” sense of the word, but acknowledged that she would be happy to teach people about how to bring hospitality to business practices – even if their business seemed unrelated to the hospitality industry. At this stage, it made sense to start by investigating the hospitality industry for options different than her previous roles – positions that would not conflict with her health concerns. 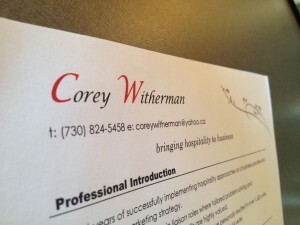 The design feature in Corey’s resume letterhead is reminiscent of a detail you’d find on a nice napkin. It was designed to appear as a “watermark.” Often premium paper (just like high end hospitality) has a detail that is recognizably unique to the brand. Corey wanted to communicate the integrity of her hospitality by including this detail on her resume. She also decided to make the first (capital) letter of her first and last name larger and more striking (in print and on screen) while minimizing the other details (for example, her address is in the footer of the first page, only her immediate contact details are in the letterhead and the font style is sans-serif and therefore easily legible) to create a clean design with a distinct flourish. All of these features are consistent with the look and feel of prestige hospitality brands. “Bringing hospitality to business” was a tagline added after the core theme was confirmed and re-confirmed through each story she shared. Since Corey wasn’t sure about what job title fit what she was able to offer exactly, this phrase served as a placeholder for networking meetings and/or information interviews when her resume might be requested without notice. When she had a job title in mind that was aligned with the content of her resume, she could then replace the phrase with the job title she was applying for. Are there things about Corey’s design story that are pertinent to your design story? Take note of what those are. Brenda was in a job that was perfectly okay. But she suspected that one day it wouldn’t be and she wanted to be prepared for what was next when that day came. Brenda was proactive and organized in her approach to writing her resume but she wanted to see herself with more clarity. She wanted to understand what she’d really been doing all these years in her various administrative roles – or perhaps more accurately put, she wanted to understand how she’d been doing what she’d been doing all these years. She thought that understanding her approach to administration would enable her to better represent herself so that she could achieve better job satisfaction. She hoped that what was next would be in greater alignment with who she was and that what was next wasn’t too far away. Creating your resume (authentically) can offer relief and peace about who and how you are like few things can. When Brenda embarked on the Resume Project process something unexpected happened. The job that she thought was “perfectly okay but starting to wear thin” suddenly seemed perfectly okay in every sense. Doing her resume from an authentic place calmed her mind and made her feel more content about where she was at and what she was doing with her life. She started to make sense to herself and stopped being so hard on herself. Undertaking the process relieved the pressure of being alive because without clarity or compassion for one’s self a career can be experienced as a race to nowhere zapping it of meaning and fulfillment. This was the case for Brenda and I believe it to be the case for many others too. The advantage of doing the Resume Project process is that it fosters self-honesty. I have worked with clients from time to time that struggle with “career aim.” This means that they selected a career or careers in very close proximity to the job that they really wanted, but their self-doubt and self-defeating socialization wouldn’t allow them to apply for the job they actually wanted. As I interviewed Brenda, I wondered if “secretly” she wanted to be the creative in charge rather than the administrative engine behind the creative type. But in hearing her stories, it was obvious and evident that Brenda truly was in the right capacity, administration. The resume bullet writing process revealed that with confidence. While Brenda’s truth was aligned with her reality in the present, there existed the possibility for Brenda to feel her purpose asking for a shift in her approach to her work. This is because “career bliss” is something that’s alive and evolves as you allow yourself to evolve. Most people don’t go to work anchored to a sense of their bliss and instead orient themselves to their boss, colleagues, their job description, the job market, their past conditioning or fear of insecurity to decide what they should do for work while ignoring their career bliss completely – not even allowing it to consciously inform decisions that don’t seem favourable in the moment. When you do this you end up missing critical cues and clues of bliss aligned action that offer you the gifts of enlightenment that you seek from a human existence. You indeed can wither away as a human being at work and that is a fate worse than most things we will experience in our lives. If Brenda found herself shifting organically in any way, she could return to the resume bullet writing process and tell new stories (from the same past jobs she held) or re-tell existing ones which would help to reveal if there was honestly a change in her desired career trajectory. And if so, her new bullets would reflect this change with easy integrity. This isn’t surprising since telling your story (your real story and not just retelling a sequence of events in a factual manner) is actually a very soul-centered, transforming, active and healing process. A human being’s evolution is revealed in the very words they use to retell stories from a new vantage point in their life. 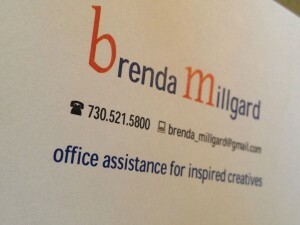 Brenda’s idea of “standing out” to a creative person as an administrator was to use color in her resume. Brenda made sure that she picked a color combination that worked well whether her application was printed in full-colour or black and white. Some colours, other than black, don’t show up well when printed on a black and white printer. As this may be the case, if you choose to go with “colour” it’s advisable to test your colour combination before committing to it by printing a black and white copy to verify clarity and legibility. To achieve the “look” with her name, Brenda used the same font, but changed the size and color of the first letter of her first and last name. She chose to put her address in the footer of her resume. You’ll notice that in Brenda’s design itself there is a cleanliness, symmetry and organization in the design itself. There’s everything you need and nothing you don’t which I think would be appealing to a creative type – they don’t want unnecessary clutter, details and systems from an administrative perspective (usually because they lack these qualities themselves and need that way of being from someone else so that they can focus on what they do best). Brenda’s header also looks like a symmetrical work of art, it’s simple yet communicative and speaks to a detailed understanding of design, organization and simplicity all which would be likely to catch the fancy of a potential employer. Her choice of font is simple, clean and clear. It’s “plain-jane” layout and says that she doesn’t need to stick out as the main event but she’ll be rock solid in the background. Are there things about Brenda’s design story that are pertinent to your design story? Take note of what those are. Download a PDF of Corey and Brenda’s resume headers here. NEXT POST — are you paid to be nice at work?